Once upon a time there was a visionary who thought it would be a cool idea to sell books on-line. Well, from small acorns, big oak trees grow and as a result Amazon is now a household name - and not just in the book market. Their latest venture is fresh produce. That's right, a bookseller has decided to break into the fruit and vegetable trade. If Amazon succeeds with that initiative, we see see far reaching changes not just in the way fresh produce is traded but in the way we deal as a society with the need to shop. Here is why. Supermarkets around the world are under considerable threat. Within the industry itself, there has always been the segmentation issue. What am I ? A full service supermarket? A discounter? An upmarket food retail experience? A hypermarket? A neighbourhood store? What is it going to be? That debate has been going on for decades. Some formats disappear, some new ones emerge, stores are either owned by corporates or operate through he co-operative model. At the end of the day, the consumer was the ultimate judge of what worked and what didn't and consumers voted with their feet. That all changed when it became apparent that the Internet could be used for shopping. Suddenly, home shopping became a real option and these days many food retail chains across the developed world operate on-line shopping services alongside their stores - their traditional brick and mortar channel. Building stores taking time, money and land. The bricks and mortar used to build the stores represent a significant investment and when one gets this wrong, it costs. Store owners will therefore go to extraordinary lengths to analyze the catchment, the opposition stores in the area, the socio-economic profile of the people living within the reach of a store, the traffic patterns - everything. Stores make money when sufficient numbers of customer shop for beyond a certain volume of goods and ideally choose from the stores' entire range across all categories on display. The exact figures and benchmark data sets will differ from store to store as every store is different. All stores however share the grim reality that when the store foot traffic starts dropping - for whatever reason - profitability heads south and eventually the store makes a loss. Not a good situation to be in and to be avoided at all costs. So when the Internet came along and shoppers wanted to have the option of shopping for groceries online, the supermarket owners and operators were faced with a dilemma. How do we meet our customers' needs without impacting on our store profitability? The reality is that this was asking the impossible. Supermarkets which developed on-line shopping options incurred development costs, incurred new infrastructure costs and saw shopping patterns in their store change as customers took up the on-line options. The net result were reduced margins. And now Amazon comes along and wants to start selling fresh produce on-line. So what, one may ask? Didn't Walmart one day decide to enter the grocery game? And the world is still standing. What's the problem? Well, the problem is that when Walmart decided to add food to its store assortment, the operative word was 'store'. Walmart entered an existing market segment new to them but the underlying trading platform was the same the supermarkets were using. Bricks and mortar - stores. Amazon is a different kettle of fish altogether. Amazon has no stores. 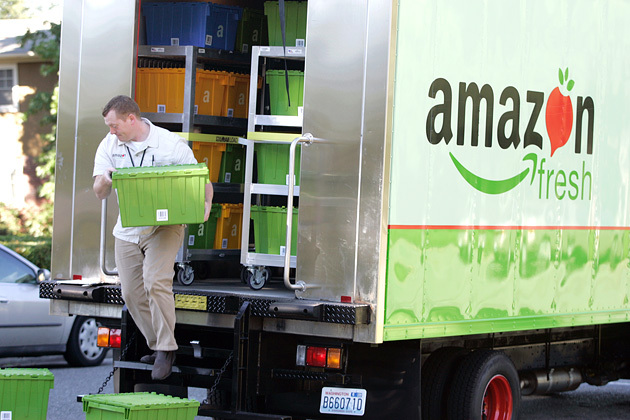 Amazon has fulfillment centres, smart technologies and a fleet of trucks for its Amazon Fresh service. OK, we are talking about the same Amazon here which has yet to make a profit despite its market dominance and its shareholders are beginning to get impatient. But Amazon will not have to worry about how it will balance the margin needs of its stores with the expansion of its on-line food service - remember, Amazon has no stores. "Does Amazon stand a chance to get a sufficiently large slice of the food retail pie?" The answer is "Yes, eventually" and with that belief comes the realisation that brick and mortar shopping is in for its next cataclysmic change sooner rather than later.